Fried’s career as an art critic in New York culminated with the publication of one intensely theoretical and aggressively polemical essay, the justly (in)famous “Art and Objecthood”, published in June 1967. In that essay, Fried’s descriptive mode took a backseat to the theory deployed in its stead. The American scene had become vigorously competitive and “Art and Objecthood” represented Fried’s attack on modernism’s chief rival, minimalism. Taking its cue from Frank Stella’s austere early stripe paintings, minimal art that carried Clement Greenberg’s reductionist interpretation of modernism[iv] to its logical conclusion, resulting in the production of objects that did away with all traces of illusionism. Purporting to go “beyond painting”, a minimalist object presented to the beholder nothing more than its own literal existence (its “objecthood” to use Fried’s coinage) in the environment of a gallery space. Minimalist objects were meant to straddle the boundary separating art from non-art, in effect declaring that boundary to be arbitrary; they were created and displayed in the spirit of Marcel Duchamp’s ready-mades, which mocked the beholder’s assumption that an art object is sensuously distinguishable from any ordinary object in the world – whether it be Duchamp’s urinal or Tony Smith’s six-foot black steel cube called Die (1962). This mocking intent and effect is pertinent to Fried’s argument, according to which the minimalist object invariably addresses the beholder in ways that are essentially rhetorical – provoking, confronting, mystifying, cajoling, soothing, threatening, and so on – ways that Fried characterized as corrosively “theatrical”. Literalism (as Fried dubbed it) required the viewer’s presence to generate significance as a theatrical performance requires an audience; the theatricality of literalism refuses to allow the beholder any other position than that of an audience, without which the object is incomplete. Whereas minimalist art solicits the viewer in such a way that the viewer’s actual experience navigating the space surrounding the work constitutes its significance, modernist painting (or sculpture) exists independently of the viewer, merely by virtue of the internal relationship of its parts. Because its significance does not depend on the beholder’s experience of it (to see “how it turns out” as in a theatrical performance), the modernist work – when successful – is entirely present to the beholder all at once in an instant. It has the quality that Fried called “presentness”, which is the opposite of theatrical effect. I would like to say that it was this sense of moral urgency, inherent in the modernist enterprise, that ultimately led Fried to abandon his descriptive mode in favor of the theorizing we find in “Art and Objecthood.” (The danger of moral fervor is that it may veer into strident moralism, with its bad conscience.) Theory – the advancing of theses – inevitably ends in polemics[vi] – because every thesis generates its antithesis – and is therefore subject to the shifting drifts of fashion. Thus, in “Art and Objecthood” Fried took the liberty of proclaiming in openly militant terms that “theater and theatricality are at war today, not simply with modernist painting … but with art as such”, and that the “success, even the survival, of the arts has come increasingly to depend on their ability to defeat theater.”[vii] Fried’s militant stance quickly turned out to be ill-advised because within a few years after “Art and Objecthood” was published it had become evident that the passionate call for anti-theatrical art would be not just unheard but repudiated as the “art world” came to be dominated by work that was explicitly and proudly “theatrical” in exactly the sense denounced by Fried. Modernist seriousness gave way to post-modern irony – the knowing smirk of the inside joke that differentiates between the in-crowd and everyone else. To see what is lost when questions of quality and value and conviction become irrelevant, it is worth taking another look at Fried’s descriptive criticism leading up to “Art and Objecthood”. It must be emphasized first of all that when Fried describes a modernist painting or sculpture, he is not, or not only describing the thing’s visual and physical characteristics and qualities. They are phenomenological descriptions, which means that the description of the object’s visual and physical characteristics is made to serve a philosophical purpose, namely, to allow the thing being described to reveal itself, to make itself present the eye. It is also crucial to realize that the things being described are a peculiar category of things – paintings and sculptures. Art works differ from other objects in at least two significant ways. First, unlike other kinds of things, works of visual art really are as they appear to be; because a painting or sculpture exists as art exactly to the extent that it makes itself present to the eye of the beholder, an accurate description of the thing’s appearance is also a revelation of the thing’s essence, the kind of thing it is, as distinguished from other kinds of things we encounter in the world. Second, a work of art is an intentional object. It was created by someone and it is meant – in the way that human actions are meant, or the way certain linguistic utterances are meant, e.g., to question, challenge, affirm, forgive, and so on. The fact that certain traditional media – media that in the past naturally conveyed artistic intention (narrative, symbolism and perspective for instance) – are no longer available means that every element of the modernist work is saturated with intentionality, not necessarily the artist’s conscious intention, but with significance. The significance, for example, of the artist’s decision to place just this mark at just this location on the canvas rather than some other mark in some other position, and so on. The significance of Anthony Caro’s decision to place any element of his sculpture just as it appears in the finished work – is similar to the significance of a speaker’s decision to use just this word rather than some other when speaking, or to speak rather than remain silent; in order to achieve significance (i.e., make sense) the speaker’s decision must be responsive to its occasion. In the modernist situation, the artist him- or herself must create the occasion and the response; therefore, the artist bears absolute responsibility for rising to the occasion, realizing it in the finished work. Whereas in moral life, human action moves precariously from intention into the world, so that excuses and justifications can mediate between good intentions and bad results, in modernism, the artist’s responsibility for realizing intention is absolute. The absoluteness of the artist’s responsibility accounts for the difficult demands the work makes on the beholder; it is a demand that the significance of every detail must be acknowledged, or not. Failure to bear up under this pressure means that the artist has failed to mean what he or she has done, so that the entire work, no matter how tasteful, pretty, interesting or aesthetically pleasing, collapses into incoherence. As a literally existing object, the sculpture may be described as two contrasting steel elements running along the ground, two parallel uprights, each about 4 feet tall, and two contrasting components that rise from the base of each upright, one cursive and one straight, connecting the two ground-running elements. The entire configuration is painted in dark blue. It is a composite object that doesn’t resemble any familiar object we’ve encountered in the world. This analysis of Deep Body Blue illuminates the “pressure” under which modernist art must succeed if it succeeds. Fried observes that if the two uprights are even slightly out of alignment, the sculpture as a whole begins to fall apart, to become arbitrary and therefore meaningless. That is because the alignment of the two uprights – their standing in the same plane – is what allows them to be seen as a kind of “abstract door”. Without that alignment, the uprights – and therefore the rest of the sculpture – would become arbitrary because it would be seen not as a kind of door but as a kind of complex multi-part but literal object. Its “objecthood” would eclipse its illusiveness. Fried’s observation shows that the kind of illusiveness sought by modernist sculpture is not the same as “illusion.” We experience Deep Body Blue as a kind of door but not as a representation of a door; that mode of illusiveness – the traditional media by which sculpture was able to represent the world – was no longer available to Caro in 1966. Those media had by that time lost their power to convey sculptural significance, and therefore compel conviction in the beholder. It follows that the “objecthood” of the sculpture – the materials from which it is made, the identity of the steel elements and the way they are welded one to another – all of that could not be hidden or covered up or masked or presented in any way that is not completely obvious to the beholder. Hence the pressure in the teeth of which modernist illusiveness must be secured. Fried’s remark about the alignment of the uprights also indicates the kind of “door” that is discovered in Deep Body Blue. The door is discovered in the placement of the elements that comprise the sculpture and not in their identity, especially the placement of the two upright columns on the same plane. It is the parallel placement of the upright columns, aligned in the same plane separated by a space wide enough to allow a human body to pass between them, but not so wide that the body does not pass through them – in short, their placement so as to create a passage as if into or out of one region to or from another – that illusively establishes a door. In approaching Deep Body Blue I come upon something that for some reason I want to call a “door” – although it looks nothing like any actual door I have ever encountered in the world. And the fact that I want to call this a door allows me to realize that I don’t really know my reasons (or if I have a reason) for calling any of those other those familiar things a “door”, any more than I know my reasons for calling this a “door” – yet I do want to call it a door. The reference to Wittgenstein is worth exploring if only briefly. In the Philosophical Investigations Wittgenstein wrote: “Essence is expressed by grammar.”[xi] “Grammar” refers not to the definitions found in dictionaries or the rules contained grammar texts but to certain conventions of usage. Wittgenstein also uses the word “criteria”; the grammar of a word reveals the criteria for the thing to which the word refers. So, for example, when we recall how the word “door” is used in significant utterances, we will know what counts as a door and what doesn’t. A thing is not a door by virtue of participation in Platonic forms, or by being an instance of a logical “universal”, but by virtue of the fact that we engage with it as a door – opening it to enter, closing it (or not) upon exiting, locking to keep others out, unlocking it to allow others in, passing through it from one room to another, and so on. These and similar ways of engagement constitute the criteria for something’s being a door, and they are grounded in what Fried calls “particular modes of being in the world” – entering, exiting, coming, leaving, arriving, being inside, looking out, passing through, and so on. If we were not the sort of beings we are – embodied beings, with bodies within a certain range of height and width, ambulant on two legs, which construct shelters often (but not always) divided into discrete rooms, and which provide security and privacy but can sometimes be invaded – we wouldn’t find it worth talking about doors. Nothing would count as a door. Deep Body Blue can be said to discover or lay bare the conditions for something’s being a door in our world because the sculpture makes manifest those modes of being in the world within which anything counts as a (literal) door. Doors are approached, entered and gone through, and nothing is more familiar in our world than approaching, entering and going through doors, from one place to another on a daily basis throughout our lives. But when we approach, enter and go through the abstract door that is Deep Body Blue, we do not pass from one place to another – and of course, we do not approach, enter or go through anything in the literal sense of those words. We encounter modes of being in the world that are deeply and pervasively familiar to us, but in a way that allows those modes of being to be experienced as something quite extraordinary. In this sense, Deep Body Blue reveals something we might think of as the extraordinariness that inheres in the ordinary. We approach, enter and go through the abstract door to get to the place where we already are but transformed. The literalness of our lives is for a moment suspended, so that we at least for that moment are able to stop theatricalizing ourselves and others. Deep Body Blue is finally “about” the resources of art in general, its capacity to redeem our lives. [i] I am referring to “Shape as Form: Frank Stella’s New Paintings,” (1966), “The Achievement of Morris Louis” (1967), “New Work by Anthony Caro” (1967), “Ronald Davis: Surface and Illusion” (1967), “Two Sculptures by Anthony Caro” (1968), “Recent Work by Kenneth Noland” (1969), “Caro’s Abstractness” (1970), “Problems of Polychromy: New Sculptures by Michael Bolus” (1971) and “Larry Poons’s New Paintings” (1972). These articles (including an expanded version of the Morris Louis article) are collected in Michael Fried, Art and Objecthood (Chicago 1996) (hereinafter “Art and Objecthood”). [ii] In § 124 of the Philosophical Investigations Wittgenstein wrote: “Philosophy may in no way interfere with the actual use of language; it can in the end only describe it.” And in § 109: “And we may not advance any sort of theory. There must not be anything hypothetical in our considerations. We must do away with all explanation, and description alone must take its place. And this description gets its light, that is to say its purpose, from the philosophical problems.” Ludwig Wittgenstein, Philosophical Investigations, translated by G.E.M. Anscombe (New York 1968). [iii] Fried has written that beginning in the late 1960s, “the kind of criticism Greenberg and I practiced, each in his own way, was intimately linked with the values, qualities and aspirations of the high modernist art we found so compelling, and that with the ever growing eclipse of high modernism in the later 1960s and 1970s (and after), the role of criticism became transformed – into cultural commentary, ‘oppositional’ position taking, exercises in recycled French theory, and so on.” Art and Objecthood, p. 15. [iv] Roughly, Greenberg’s theory was that the modernist enterprise involved testing a variety of conventions to determine which were inessential and could be discarded; what was left over, so to speak, constituted the essence of a particular art. In “After Abstract Expressionism” Greenberg wrote: “Under the testing of modernism more and more of the conventions of the art of painting have shown themselves to be dispensable, unessential. By now it has been established, it would seem, that the irreducible essence of pictorial art consists in but two constitutive conventions or norms: flatness and the delimitation of flatness; and that the observance of merely these two norms is enough to create an object which can be experienced as a picture; thus a stretched or tacked-up canvas already exists as a picture – though not necessarily as a successful one.” Clement Greenberg, Modernism with a Vengeance 1957-1969, vol. 4 of The Collected Essays and Criticism, ed. John O’Brian (Chicago, 1993), p. 30. [v] The concept of conviction became critical to the experience of art during the modern period when the traditional devices of art-making (e.g., the devices of representing reality) had lost their capacity to self-evidently identify an object as a painting or a sculpture, thus creating the risk that any purported painting or sculpture might be seen as nothing more than an object. [vi] In § 128 of the Philosophical Investigations Wittgenstein wrote: “If one tried to advance theses in philosophy, it would never be possible to debate them, because everyone would agree to them.” Stated otherwise: To the extent that one does advance theses, one is not doing philosophy but rather politics, or perhaps religion. In Wittgenstein’s later work, the advancement of philosophical theses is seen as a temptation in philosophy, which must be resisted not by the imposition of counter-arguments (anti-theses) but by the disappearance of philosophical “problems” themselves. [vii] Michael Fried, Art and Objecthood, p. 163. [viii] Michael Fried, Four Honest Outlaws: Sala, Ray, Marioni, Gordon (New Haven and London, 2011), pp., 22-23. [ix] It should be noted that in recent years, Fried has resurrected in a limited way his art-critical writing, specifically in a valuable book on contemporary photograph. See Michael Fried, Why Photography Matters as Art as Never Before (New Haven, 2009). 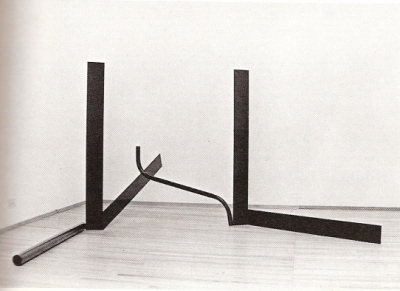 [x] Fried, “Two Sculptures by Anthony Caro” in Art and Objecthood, pp. 180-81. [xi] Philosophical Investigations, § 371. It’s good to read a positive and well-researched account of Michael Fried’s writing on Anthony Caro. His understanding of Caro’s sculpture obviously shaped his arguments against minimalism. In his early comments he emphasise expressiveness and ‘passionate gesture’ within Caro’s work but this later shifts into a discussion of ‘norms’, (rectilinearity, frontality, axiality, horizontality,) rooted ‘in certain basic facts about being in the world and…possessing a body’. It was this topic rather than modernist issues specific to the medium of sculpture that Fried focussed on, comparing the experience offered by Caro to that of the minimalists. In describing this difference Fried calls on a wide range of sources, including Merleau-Ponty and Wittgenstein, but also the American philosopher Stanley Cavell. Cavell had dealt with the problem of theatricality in reference to the study of music and drama but had come to somewhat different conclusions to those Fried formulated in ‘Art and Objecthood’, if not in ‘Absorption and Theatricality’. Cavell’s other subject was the question of scepticism, a kind of hazard that occurs in philosophical thought that can lead to doubt about the very existence of the external world. In a doctoral thesis on Michael Fried’s Art Criticism (University of Essex, 2003) I argued that scepticism was an important factor in ‘Art and Objecthood’ partly because it was a riposte to earlier essays by Rosalind Krauss (‘Allusion and Illusion in Donald Judd’, 1966) and Don Judd (Specific Objects) promoting the ‘real’ as a basis for art experience. The sceptic sees the real as problematic and perpetually asks ‘How do I know it’s not a dream?’ Phenomenology doesn’t defeat scepticism, nor does merely presenting literal objects in a room. Rather than transcendence, Fried’s appeal to ‘abstract doors’ has to be seen in this context. An ‘abstract door’ is as credible as a ‘real door’ and what’s more, under circumstances where it is ‘discovered’ as in ‘Deep Body Blue’, it can ‘convince’ in a way an actual door will not. ‘Conviction’, as an experience, refutes scepticism and can also take on an aesthetic dimension. Looking back nearly fifty years, one can be almost nostalgic about the audience for literalism that Fried regarded as being corrupted by theatre. The art this audience may have been wrong about wasn’t trivial or lightweight and Fried’s critical faculties and powers of theorisation were fully extended in pointing out its limitations. He took it seriously, and I think he hoped to lead its audience, through a path of critical enlightenment, towards a more sympathetic consideration of the modernist practitioners he so strongly supported. Since then criticism has had less of an audience to work for. The audiences for minimalism and modernism have been replaced by other groupings. By far the largest of these are public gallery visitors en masse. They contribute to continuing state patronage for major institutions because they can be counted and their footfall recorded to support an economic case for the arts. But they want information and coffee rather than critical evaluation. And there’s another audience that takes a more intense interest in visual art, a very much smaller group who have been corrupted not by theatre, but by the presence of money. This audience can be defined in negative terms as those found in an art gallery who are neither buyers nor sellers. They probably will have views on the quality of the art they see but they know that their opinion will not affect the business that the gallery conducts, and which has no use for criticism, however enlightened. David Sweet: I find the concept of “theater” as used by (respectively) Cavell and Fried (when discussing modernist art) at times less than precise. For me, a more productive way to understand what Fried got from Cavell is to examine the latter’s highly original practice of ordinary language philosophy (so-called). In particular, Cavell’s analysis of how it is that the point of an utterance (in a particular context) is determinative of its meaning, which leads Cavell to the memorable formulation (in The Claim of Reason) that (paraphrased) “what can comprehensibly be said is what is found to be worth saying.” In other words, the meaning of an utterance cannot be derived from the meaning of the individual words and their syntactical relation, and a well-constructed sentence using well-understood words cannot have meaning unless it is meant (by someone in a circumstance in which saying it has a point). In a similar spirit, Fried demands that the modernist artist assume absolute responsibility for the work in every detail, never assuming or taking it for granted that forms or materials by themselves can carry that responsibility. I tend to think of this as the necessity that the modernist work “confront” and somehow suspend the inescapable fact of its own objecthood at every point. Fried finds that Anthony Caro’s work takes on this challenge, as when Fried says that Caro’s work “essentializes meaningfulness as such” – that is, the human capacity to mean anything at all. Thank you for that thoughtful comment, David Sweet. When I have more time I will read it carefully and respond. Interesting and well-considered essays, Carl, and it’s good to re-examine these conditions of sculpture. As you rightly suggest, “…the value of a thing is never secured once and for all…”; all our best efforts at evaluating quality, aesthetic or otherwise, are contingent and qualified. And so the dichotomy of ‘Art’ (Caro) against ‘Objecthood’ (Minimalism) in the writings of Fried that you so rationally analyse here seems much less clear-cut now than in 1967. There appears quite a degree of literalism yet in even Caro’s approach – maybe not so literal and banal as the Minimalists, but his work seems in the light of subsequent thinking much less abstract than Fried suggests. It has become apparent that having a simplistic relationship to the floor that such sculptures as ‘Air’ or ‘Titan’ have (i.e., laying out across the floor, spreading horizontally but not vertically, wherein gravity is rather literally ‘demonstrated’); or relating to architectural features such as doors or windows, as ‘Deep Body Blue’ or ‘The Window’ do; is in itself a literalist project of sorts and by degrees, and in no way explores the full potential of free and imaginative abstract three-dimensional form and space. Fried and many other commentators seem to think that abstract sculpture starts and ends with Caro, but time will put that in perspective, and we will see that it is just a beginning – perhaps just part of a beginning. What’s more, I cannot see how there can be any such thing as an ‘abstract door’; a door is a door, and something that acts like a door is in fact also a door; and something that reminds us of, or suggests a door, is a representation or symbol of a door. None of those conditions is abstract, and the same goes for the floor. Sculpture has to stand on something – the floor, or a plinth, it matters not that much in terms of the intent of the work, though I would prefer, all else being equal, to relate to sculpture that exists quite decidedly and pointedly in the same physical space as me (I’m with Caro here) – but the abstract content of the work does not have to remain defined by or limited by that literal context. It’s only for fools to think that plinths and/or frames increase the status and value of art, of course; but the removal of these cultural signifiers in itself resolves nothing of importance. How does abstract sculpture relate to the ground? The jury is out on that one, as far as I am concerned. It could be in a million different ways, though I am personally undoubtedly indebted to Caro for his pioneering work. But his emphasis on horizontality (a common aesthetic of architecture and design in mid-century modernism, to which, on Caro’s behalf, you perhaps ascribe too much intellectual originality), his ‘architectural’ spaces, his apparent weightlessness and his stacking of elements (a very literal methodology which reveals a singular lack of physical engagement with material) are all values to be challenged, usurped, possibly ignored even. I like the sense of moral urgency and ‘pressure’ that you insist upon as part of the quest for something more than ‘mere objecthood’ – that’s good, but it’s not over. That pressure continues, and the work to find yet more abstract and more ‘present’ sculpture with a greater sense of purpose continues. I would say that your sculpture – and that of the artists to whom you are most obviously connected – is significantly less abstract than a work by Caro such as Smoulder or Slow Movement (recently on show in Yorkshire), and that is exactly what is exciting about it. Jumped in a bit hastily there. I will expand! I suppose, to get a question from a different angle, I think it is wrong to think of abstract and not-abstract as an either or. The compulsion to make an abstract structure – something which does not directly refer to things outside of itself, or which seems self-contained, bound up in its own logic – could co-exist with the compulsion to make a structure that somehow contains the world, or an aspect of how the world works, in itself. An artist could be trying to do both at once – from the outside at least this seems like a plausible way of looking at your sculpture, or at Mark Skilton’s. I don’t mean this is the point of your sculpture, but that seems to be a large aspect of how it works. Looked at from this viewpoint, the more restrictedly geometric angle of abstract art skips too neatly onto the abstract (the straight-line is a short-cut). So I would argue that contrary to your idea of dismissing geometry from being abstract, what is really problematic – boring or limited – about geometric art is that it is too simply abstract, that it is too remote from the world, and doesn’t contain enough the physicality of the world, our sense of space, light, materiality. To look at it from a different angle yet again – ‘Smoulder’ only barely makes it as a sculpture, if at all, let alone an abstract one. What are you thinking of? Caro is surely just carried away on a novelty ticket with this one (we’ve all been there), no doubt encouraged by Fried and his painter friends. ‘Slow Movement’ is not much better, being an excercise in 2D pictorial perspective made to stand up by a bit of clever slight-of-hand. Both these works are very minimal and literal, and you have to be some kind of raging Carophile not to see that these poor works contribute nothing to the world of sculptural three-dimensionality. The argument here is ‘abstract’ v. ‘literal’; and even if mine and Mark Skilton’s work has the kind of complexity that allows you and others to read all sorts of figurative stuff into it, it is irrelevant to the progression of both the work and the discussion, other than as a criticism of something we should individually try to forestall – without throwing out the baby (complex sculptural three-dimensionality) with the bathwater (figurative representations of physicality etc.). Someone just said to me ‘Smoulder’ reminds them of a range of distant mountains, and ‘Slow Movement’ is to me a picture of a road disappearing into the distance. As I’ve said elsewhere, anything can remind someone of something, and so what! Those observations do not address the condition of abstract-ness and the quality and extent of the values that it brings to any work of visual art. As far as I am concerned, any relevant discussion about the abstract values of sculpture at the present time excludes quite a lot of Caro’s oeuvre, primarily because of it’s singular lack of three-dimensionality, and most certainly excludes these two very banal pieces. if you think otherwise, you need to explain why you have a high regard for them (if you do) and why they are relevant now.